Saturday the 16th started off just like any other Saturday before. I woke up after sleeping in, made coffee, and sat down for my morning ritual of checking email, browsing the forums at pnwriders.com and advrider.com and checking the local news and weather. A quick glance at the weather report showed that the day would be rather dry in the morning hours through the early afternoon, with increasing rain into the later part of the afternoon on into the evening. 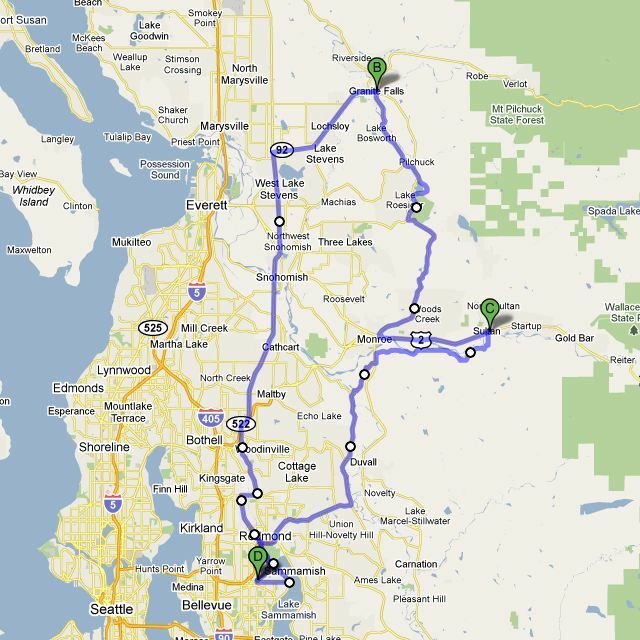 So with this information, I jumped on onto Google Maps, and started to plan a short ride for the day. There are a few places around the area I want to visit, but with the day’s outlook, I wasn’t really looking forward to a repeat of New Years Day. I don’t mind riding in the rain, I do it on what seems like a daily occurrence here in the Puget Sound Region with my daily commute to work, however I do not enjoy spending hours in it while being soaked to the bone, with the sensation of my mind going numb. So with that, I sketched my route into Google Maps. 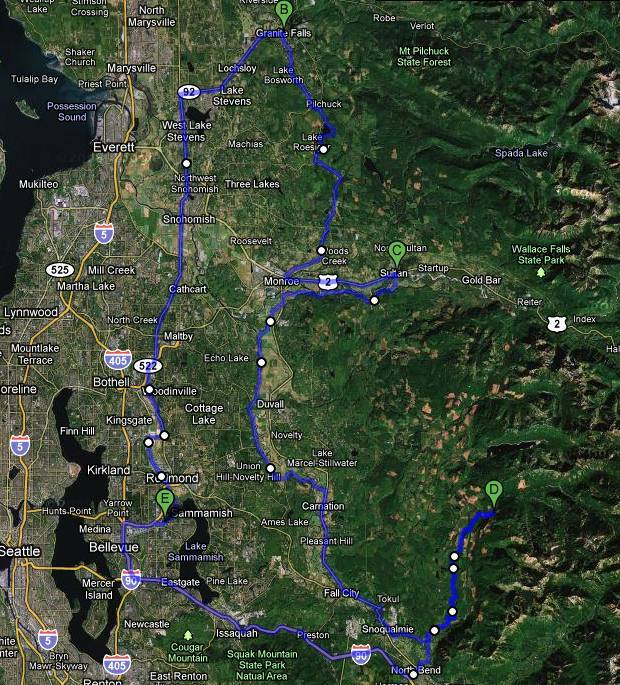 A ride up north on Highway 9, across to Granite Falls, down around Lake Roesiger into Monroe, a quick hop over to Sultan for some lunch, then back home via Ben Howard and the West Snoqualmie Highway. The route seemed to be a great choice. Coming in at 100 miles, it would take about 4 hours with the stops, putting me back home before the rain that I had seen the weatherman speak of hit home. I don’t remember taking this picture. But I like it! So I finished my coffee, took a quick shower, grabbed a fresh set of charged batteries from the night before for my camera, suited up, and set out. The start of the ride was uneventful as expected save the heavy cool air we get in the Puget Sound area this time of year. It is the kind of air that you can feel weigh you down with each breath you take while creating an eerie feeling as you cut through it as it slowly saps the warmth reserved in your clothing, lightly misting your visor as you pass through the fog. I eventually made contact with Highway 9 after winding my way through Bellevue, Redmond and Woodenville, and to me, my day’s Adventure had begun. Now, there is something that must be said about one thinking they are prepared. Knowing the night before, that I may very well be taking a quick ride for the day, I had put my batteries in my charger for my camera, a little Canon PowerShot A590. The rechargeable batteries, that for the last several months, have continued to drain more quickly with each use, however have continued to provide enough juice to last a day. So like any other morning I take off with my camera, I popped the batteries in that were freshly charged, turn on the camera, and see if the little “Battery” indicator light came on. Nope, all good. One of not so well known jewels of the Puget Sound area, not well known to the outside world, is that this time of year, a spectacular event happens that rivals that of the aurora borealis to the north. An event, that takes your breath away should you get a morning when the weather cooperates, and the clouds remove themselves from the sky. I call this event, the Ring of Fire. If it has a name, that the locals call it, I am not aware, but most know what I mean by it. At this time of year, it happens around 10am in the morning, the Sun positions itself just right, that the snow capped mountains that surround us, light up with a fiery glow of orange and yellow. A spectacular reflection of the morning sun refracting off of the Cascade and Olympic mountain ranges. As I broke through the fog bank out of Maltby, I was blessed by this wonderful sight. A sight so wonderful I stopped on the side of the road as traffic passed to take a picture to share with the rest of you. But that’s when those batteries I knew better than to continue using over the last several weeks, decided to play the upper hand, and disappointment me. The camera wouldn’t even turn on. I was livid. I pulled the batteries out, and stuffed them in my gloves with my hands to warm them, hoping that would allow things to jump around enough in them to allow just for a single photo. I waited a few minutes, then placed them back in the camera, pressed the power button, and a momentary feeling of glee passed over me as the lens started to move outward. Above I try and salvage what little time I have left to capture the mountains in their winter glory. Bad pictures adorn this review. The camera was dead, the batteries had given their last, and I was to blame. I was disappointed in myself. So much so that I kinda locked myself out of my own brain for awhile as I jumped back on my bike, and made my way to the junction towards Granite Falls, leaving behind familiar landmarks along the way as I passed by Snohomish, West Lake Stevens, and eventually to the Junction towards Granite Falls. It was sometime at this point, as I was heading down Highway 92 toward Granite Falls, that my brain decided to allow me to access it again. It also decided to let me in on its own observations it had had thus far since my disappointment. It flashed several gas stations, a shopping center, a Target. All places that would carry AA batteries to go in my camera. And if this wasn’t enough disappointment that it laid there out in front of me, it continued to verbally assault me with insults that I would rather not repeat here for the last few miles until I came across a Rite Aid at the outside edge of Granite Falls. I quickly made my way inside, grabbed a pack of bunny power batteries, and made my way to the cashier. All paid for, I went outside, changed out he batteries in my camera, and looked to see if I could get a shot of the mountains. But it was too late. My time had passed, and the parking lot of the Rite Aid proved to not be a particularly good place for a photo op. Only a single peak was visible, and even that was blocked by a tree. I snapped this photo along the way. I believe it is Mt. Pilchuck, as the name of the road, Granite Falls Pilchuck Road suggests. Against better judgeship, I snapped the picture anyways, not yet really knowing that this would set the precedent for the day. Again disappointed in myself, as well as my brain being disappointed as well, I continued on my way into Granite Falls, a right turn on to Granite, which was easy enough for me to remember, and on down the road. Now, in my complete and rather brilliance, I usually like to wing my trips. They are short, not too terribly easy to get off course, and I can usually put to memory the few roads I need to travel. A simple enough task on most any day. Brain, still disappointed in me for the events that had so far transpired, found it rather amusing when we came to a Y in the road. I sat there, stopped. I took notice that I had yet to pass any traffic yet that morning on this road, and as I sat there, I took notice that no traffic was coming. I desperately was hoping for some, to give me an idea at what direction some type of civilization was located. Thinking, still trying to get Brain to let loose the information I had stored, remembering that there was a couple Y’s in the road, but not remembering which one to take. Left, or right? Bosworth or Robe Menzel. I attacked Brain with these questions, but no answer came. So I decided when all else fails, fall right. And so I did. I continued on my way, a few short miles, when eventually a Lake came into view. I was happy, ecstatic, I had defeated Brain! Info Board at Lake Roesiger Park. Click for a Larger than Normal Picture to read. Then Brain laughed at me as I rounded the corner and a sign came into view “Lake Bosworth”. I was not humored at all, and Brain knew this. Finally releasing the reigns of my own sub conscience back to me, I was able to clearly see the path in front of me. I back tracked to Robe Meznel, and continued on my way. The road continued to wind towards my destination, the pines and fir gave way to cedars and ferns. The forest around me seemed to change instantly as I dropped down, and a vast lake came into view. Lake Roesiger is a rather beautiful area. Nestled in the foothills of the Cascades halfway between Monroe and Granite Falls, it offers some breath taking views. It is unlike most of the surrounding area, where the vegitation is mainly composed of pine and fir. Here, Cedar is the dominant tree with fee firs scattered around while the ferns cover the ground so thick in area’s it is almost impossible to see the ground beyond them. The unique shape of the lake, makes for a very pleasant drive, as the road winds around the outer edges. Lake Roesiger Park, nestled between the water front and towering trees. I eventually pass a small old general store along the lakes edge as I follow the road, eventually coming to stop at Lake Roesiger Park. I unmounted my XT, removed my gloves and helmet, and stood there and took in the surrounding area. The surface of the lake acted like a large reflecting pool, mirroring the surrounding area in it’s calm, smooth surface only disturbed by the occasional bug that would break into the surface, distorting the image temporary before refocusing the view it once provided. Along the shoreline, an elderly couple stood hand in hand as thoughts crossed my mind whether they were there just enjoying the beauty for the first time like myself, or whether this location held some memorable moment from their youth that they stood there trying to rekindle that morning. I made my way to the information board, reading about the history of the lake, and surrounding area. The moments passed by, and I eventually took a few photo’s to capture what I could, dawned my gear, and set back out for the continuation of my day’s ride. With the park now behind me, and the lake as well, I finally came to a tee in the road. Checked to my right, checked to my left, and pulled out to head southeast along Woods Creek Road. Woods Creek Road is another one of those roads that slowly winds through the area, closely following the roads name sake. As I made my way towards Monroe, and noticed how the rain has treated this creek well the last few days, due to it’s higher than average water line flooding the area’s outside of its normal creek bed, I also noticed how the area was changing. Speckled throughout the hills, amongst the small farm and ranch house’s, larger, more modern estates rose above the ground, looking as out of place amongst the more vintage dwellings as a chicken at a gopher conference. A bit of sadness passed my mind, as I looked upon how the area was changing, the farm boy of my past looked upon how the urban sprawl would eventually push these hard working families from their land and their homes, making way to growing communities of McMansions, paving the once grazing pastures where cattle once lazily rested out their days. This world was slowly changing. Some would argue for the better, while some of us look upon as another link of our past slowly corroding away to a reddish dust, effortlessly carried away by an evening breeze. Monroe eventually came into view and Woods Creek Road was left behind me as I pulled out on to Highway 2 to head eastward towards the town of Sultan. Highway 2 is a beautiful highway any time of the year. It makes its way over Cascades through several small towns and eventually over Stevens Pass to drop you off in the unique Bavarian Town of Leavenworth. A destination to explore another day when the mountains begin to thaw, and travel isn’t as easily effected by the precipitation that may come in a variety of forms such as snow, rain, or ice. It is during these winter months however, that the Cascades seem to tower above the land with their jagged snow topped peaks jutting into the sky in such a way that to any onlooker, the detail hardly goes unnoticed. At this point, my bike had just turned over 105 miles on the fuel. I was aware that 28 of those miles were from my prior commute to work the days passed, and now making the trip to work enough time to average my fuel mileage, I figured it would be a good time to top off the tank. Normally my fuel mileage taking the freeway to work averages out to around 53 miles. It took 1.7 gallons to top my tank off, giving me an average of about 62 miles on what was used from the tank. Not bad a bad trade off of 55 mile an hour riding and below. Much of my travels so far that day were under 40 mph on most of the small rural roads. It was now just after 12:45, and my stomach was starting to remind me of my lack of a suitable breakfast, which consisted of a couple cups of coffee and a couple slices of Italian Salami that I cut off as I was leaving. Sultan is a familiar spot to me. At the end of Ben Howard road, several times I have been here, and several times I have dropped in at Sub Shop #154. Sub shops are a chain of sandwhich shops that you saw pop up in the 90’s along with the Subway and Quiznos craze. A key subtle difference between a Sub Shop and Subway though, is that Sub Shop slices the meat right there, and the meat is much more flavorful. Stacked high with the fixings, Shop Shop sandwiches are a treat to get if you have the time to seek one out, or the appetite. Ranging from your standard Turkey, to a sandwich called the destroyer which is stacked with over 2 lbs of meat and cheese, these sandwich’s will demolish even the largest of appetites. So with my hunger padded away with a full french dip sandwich, which I should have probably got a half, as my hunger was satisfied well before I finished, I put on my gear, and headed outside… Into the rain. It seems, while I was sitting there, enjoying my meal, the clouds decided to no longer float above lazily, and instead felt the needs to open up, letting down those wet droplets we like to blame for our mishaps and ruined experiences. However, I was not going to let it happen to me. It wasn’t raining all that bad, a drizzle is what I’d be more apt to call it. Not worth deciding to head straight home. The Skykomish River along Ben Howard Road. Not to be confused with the Snohomish River. Got it? Good, cause I was. So with that, I headed out, waited for a trail to pass, and made my way towards Ben Howard Road. Now, I need to take a moment here and give the larger picture of this ride from this point forward. As mentioned previously, this part of my ride is rather familiar as I had been over it countless times on my R6. Enjoying the winding road as it passed through the valley. Why the road winded through there was always a mystery I never really spent much time pondering before. I just would rather let the increasing regularity of the corners and the tarmac do the talking, and lay my mind at ease as I became one with the road. So it would be a rather big surprise when I would come to realize that their was a river that the road followed. Now you may laugh at me, you may not believe me, but I can assure you, as many times as I have been over this road, I never really took the time to pay attention to what was just off to the north of it. I knew the Bridge going into town crossed over it, and I knew that there was a river in the area, but for what it’s worth, I was completely stumped when I realized the road actually followed the river. Now, as I was traveling down the road, I pulled off in a couple places. The first, just a couple miles from the turning point on to Ben Howard, sat above the river. It has a couple trails that went down to the rivers edge, and I proceeded to try and make it down. It was then I was reminded that I was not wearing my normal riding boots that have soles that would work well enough in the damp river bank, but instead my sport bike boots in lieu of my others as they were being resoled at the shoe shop. The flat, non cleatted soles easily slipped on the silty wet surface of the bank, and I thought wiser than to continue my way down. So I jumped back on my bike, and went on my way. My big water crossing of the day! As I continued my way down Ben Howard, the sky finally stopped dropping its droplets and the sky began to open up in area’s, giving signs of blue sky in the distance. Further down the road, I spotted another full off. This one was marked as being a Public Access Area with a small boat launch. I decided to pull off here as well. Here, I was able to get up to the river, take a look around, take some pictures of the river, and watch as it passed on by. Much like Woods Creek, you could tell the rains had been good for the river, as its water touched higher than it normally flowed, creeping up into the crevasses of the river bank, where the vegetation was eventually submerged by its inflated mass. On my way again, I continued on my way, eventually turning off of Ben Howard, and making my way to the West Snoqualmie Highway on rural roads that put you through the local dairy’s and farmland. As I was making my way towards one of my final turns before heading back towards the City of Redmond, the clouds in the sky started to break apart, the sun began to shine down, and the blue expanse of the afternoon sky was in front of me. Mesmerized, I passed my turn off, continued on the highway, and eventually made my way to and then through Carnation. I was not going to let this day go to waste. Graced with the blue sky’s, I continued along the valley floor in search of more roads to travel. I passed through Fall City, made my way up towards Snoqualmie Falls, all places I have visited before on my R6. All familiar. Mt. Si towers above the town of North Bend. A landmark hard to miss. What I needed, was something new. I needed to go somewhere that I had not gone before on the R6. Somewhere I couldn’t navigate easily with the low ground clearance, and stiff suspension. Ones that I had previously been unable to explore on my R6. It was time to use the XT once again for it’s past life’s purpose. It was time to say goodbye to the even contour of the black tarmac, and say hello to the dirt, scattered gravel and rocks of the surrounding forest roads. Not entirely familiar with the area, I remembered of a road that a riding buddy of mine and I had come across in our search for a good twisty road. The road was marked as being closed 20 miles ahead, so we had just turned around, before even going up it. So I decided this would most likely be a good place to start. Upon once again finding this road, and going about a half mile in, the tarmac disappeared, and my tires hit the dirt, my assumptions were correct. It was time to finally go explore the wooded wilderness. I figured, being a rather developed road, developed in the sense that it seemed to be regularly traveled, this would be an excellent shake down ride for the XT. Having spent all its time now riding around on the black top paved tarmac, I had been unable to get it off the beaten path so to say. Now this is the main reason I really missed my XT. The ability to just go. And by go I mean, pick a direction, pick a type of road, and just go. Whether it is groomed or torn up with potholes and washouts. I wanted to be able to finally get out and explore these area’s, regardless of how many other people before me set eyes upon the landscape. This was now my Adventure. The road continued on, what seemed for miles upon miles. Surely I had to be coming to the end soon? I dropped down off a hill into a clear cut area. It gave view to a spectacular view of a lone snow capped rock formation, that I wish I could share, but the photo I took, for some reason turned out too horrible for me to post on here. I continued on, stopping here and there for brief moments as I checked my current distance in, and the time. At 3:25, I told myself I best be heading back soon, as the early winter darkness would soon be falling upon me. So I continued on for another 5 minutes, and what I came across was worth it. Just right up the road, not much further I came across a bridge crossing over the North Fork of the Snoqualmie River. The sun positioned in the sky almost directly in the center of the river channel provided a spectacular view. I decided to at this point, call it a day. I took a couple more pictures, and noted that I must come back this way again and finish out this road to the end. An extra 100 miles of unplanned riding was a welcomed end to my day. I tallied up the odometer and it seems I was only about 10 miles in. So there was another 10 more miles to explore. Soon I’ll return to finish out the of the road. I would also like to get a better picture of the river at this spot, as the sun reflecting in the lens of my camera made it hard to take a picture that wasn’t affected by the direct sunlight. So with that, I mounted my XT, turned around, and headed on my way back home. As the sun began to set, I pointed my bike in the direction of I-90 to make a quick ride home. I eventually made it home, almost 7 hours after I had originally set out for the day. A beautiful end to what started out as an imperfect day. It seems, much like the last time I went riding, the weatherman’s forecast was off a little. But I’m not complaining. It was a welcomed mistake that I’ll take any day over the pouring rain of the New Years ride. Good read. Next time you’re up around Granite shoot me a PM and I’ll show you the other roads you missed. Seems like there’s a dozen ways to get back to Monroe from here. As the setting sun reflects across the surface, a small stream down river gently falls into the North Fork of the Snoqualmie River.